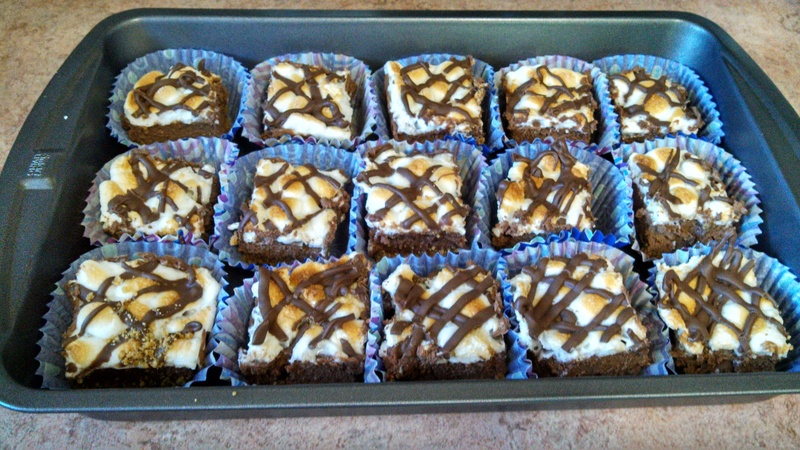 The opportunity to bake a sinful treat arose this past week as my client site had a cookout. 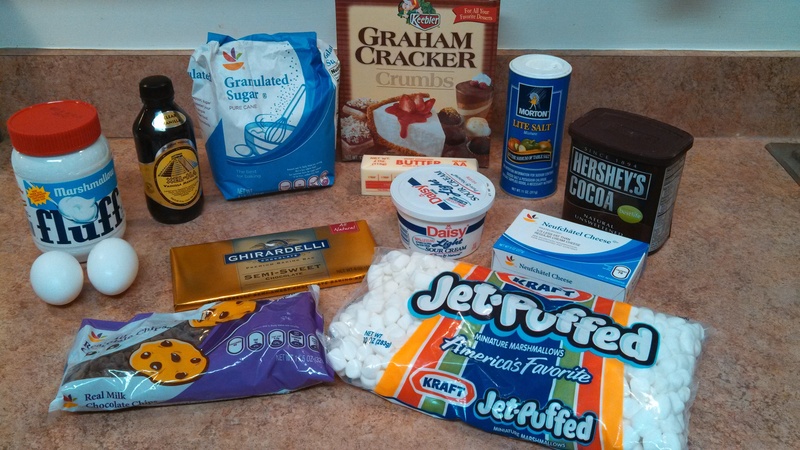 While I didn’t have to do anything besides contribute $5, I really wanted to make a new treat. Bryan loves when these inspirations hit me! I thought something s’mores related would be a win. 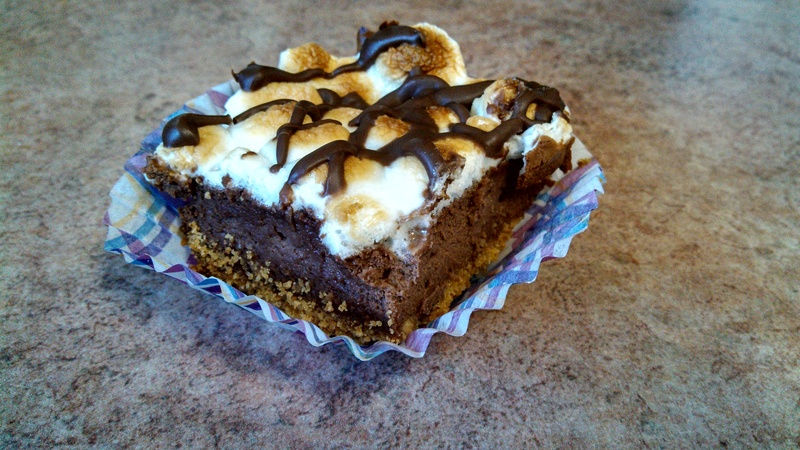 I found a number of s’mores bars that I wasn’t all that jazzed about, but then I came across a s’mores bar WITH CHEESECAKE recipe. Thanks to Annie’s Eats, I had some happy co-workers. Thank goodness too because these phenom bars involved the labor of love! 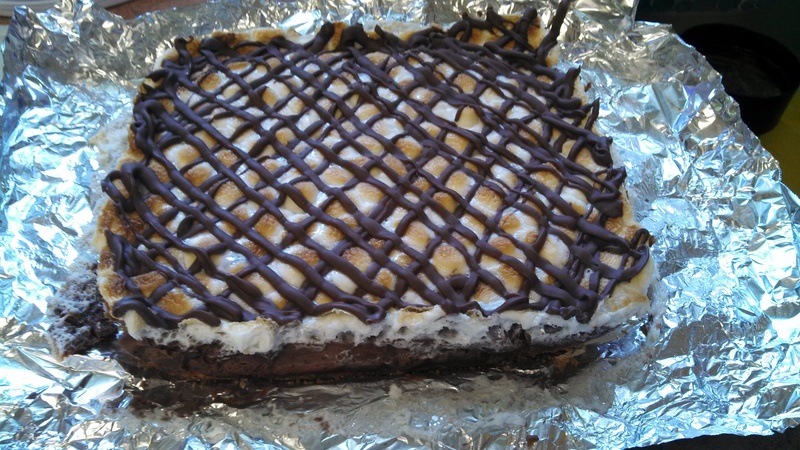 This recipe yields about 12-16 bars which was not enough for the crowd I was making them for. Thus, I doubled this recipe. Still, not a big deal until you 1) only have one 8 x 8 pan 2) arrive at the grocery store at 10 pm to gather ingredients and 3) don’t begin making them until 10:30 pm on a Wednesday night. I felt accomplished as I climbed into bed at 1:30 am! Preheat the oven to 350˚ F. Line an 8×8″ baking pan with enough foil for the edges of the foil to be easily pulled out (this matters later on! ); spray lightly with cooking spray. Combine the graham cracker crumbs, sugar and melted butter in a small bowl. Stir together with a fork until well combined. Press the mixture in an even layer into the bottom of the prepared baking pan. Bake 10 minutes; transfer to a wire rack while you prepare the filling. Reduce the oven temperature to 325˚ F.
Place the chopped chocolate in a heatproof bowl set over a pan of simmering water. Heat until melted and smooth, stirring occasionally. Alternatively, place chopped chocolate in a microwave-safe dish and microwave for 30 second increments at 50% power, stirring each time. Remove from the heat and let cool slightly. Using a standup or hand mixer, combine the cream cheese, sour cream and marshmallow cream. Beat on medium-high speed until smooth and well combined, 1-2 minutes. Blend in the cocoa powder, vanilla extract and eggs until incorporated. Stir in the melted chocolate until well blended. Pour the filling over the graham cracker crust and smooth the top with a spatula. Bake about 30 minutes, or until the center is just set (does not jiggle when shaken gently.) Remove from the oven. Evenly top the cheesecake layer with the mini marshmallows. Return to the oven for 2-3 minutes, just long enough so the marshmallows begin to melt into each other. Transfer your foil pan to a wire cooling rack. Using a kitchen torch, lightly brown the tops of the marshmallows. Alternatively, this can be done underneath the broiler with a very watchful eye. I used the broiler for exactly one minute, but I watched it for every one of those 60 seconds!